Attractive Brazilian Style Pant Form. This model cannot wear shoes. Height: 47", Waist: 25 ½, Hips: 39". Color: fleshtone. Attractive Brazilian Style Pant Form, made of durable plastic. This model cannot wear shoes. Height: 42", Waist: 25 ½, Hips: 38". Color: fleshtone. Brazilian style full round display mannequin is a great way to show off your merchandise with a Latin flair. This model separates at waist line for easy dressing. This model cannot wear shoes. Color: white. Female mannequin is a great way to show off your merchandise with a Latin flair. This model cannot wear shoes. Made of durable plastic. Color: white. 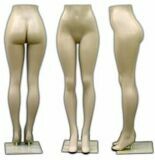 Female mannequin is a great way to show off your merchandise with a Latin flair. This model cannot wear shoes. Made of durable plastic. Color: fleshtone.